When an Autobot is seriously damaged in the field he goes to Autobot Ratchet, but for everyday aches and pains, Hoist is the most trusted guy around. There's no strut or spar Hoist can't fix, and no malady so baffling that he can't diagnose it. He supplements his vast knowledge with an easy bedside manner that makes him well liked by his fellow Autobots and universally acknowledged as the expert on everything from wrist rust to scraplets. Hoist exists in a strange place in my head. Although he's an early Generation 1 character, he's one that I wasn't aware of at all in my childhood. 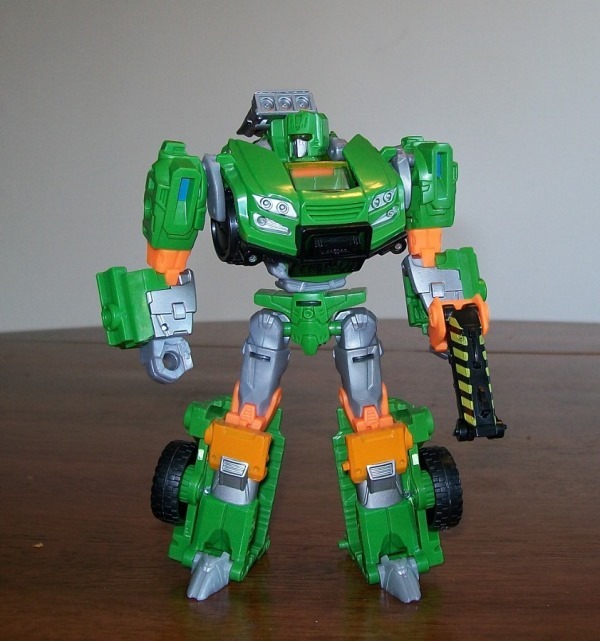 Like fellow 1985 Autobot cars Smokescreen, Skids, Tracks and Red Alert, the character's existence didn't register with me until much later and I didn't find out what he looked like until 2002 when I got access to the internet. I picked up a reissue of the Generation 1 toy in 2003 when Toys'R'Us started dropping the prices of the reissue line, and I was surprised by how much I liked the stocky, clunky-looking maintenance guy. 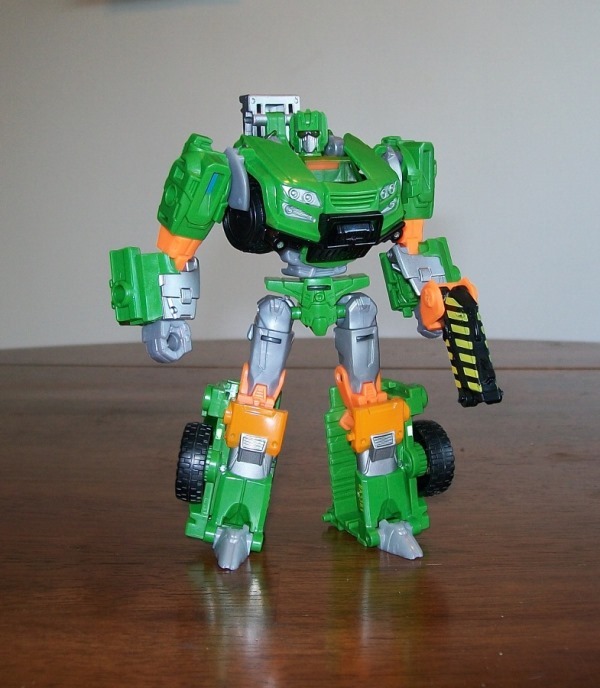 When Hasbro announced a new Trailbreaker toy I was happy because the two characters have traditionally shared a mold, and a Trailbreaker release surely meant that Hoist wasn't far behind. And he wasn't...but by the time I found the toy my enthusiasm had waned a bit, because the new toy is based not on the clunky G1 Trailbreaker but on the far more streamlined IDW Trailcutterbreaker. And as good as the new design looked, I had a hard time seeing Hoist that way. But does it work in person? Robot Mode: Hoist comes packed in robot mode, so we'll review that first. The figure has the colour scheme you'd expect, mostly green with orange, grey and silver highlights. And he's definitely carrying less bulk than Hoist usually does, with fairly normal proportions for a humanoid robot. Hoist's chest transformation is notably different, with the hood now protruding on an angle in a way reminiscent of Prowl or Jazz instead of folding flat, Sideswipe-style. He lacks the towing-rig backpack that the original wore as well as the small 'wings' that protruded over his shoulder, which means that all in all his silhouette isn't very Hoisty. His head is quite "off-model" as well. It includes all of Hoist's traditional features, but squeezes them into half as much horizontal space as usual, making it look like someone crushed his head in a vice. He does have his behind-the-head scanner package, this time permanently attached to the toy instead of a detachable accessory, but that and the colours are the only hint at who he's meant to be. Hoist has some other issues as well. The one that people are most vocal about is his size. The character was one of the larger Autobot cars in the 80s, but he's quite small compared to most modern cars. By way of comparison, out of my collection only Bumblebee and Hound are definitively smaller, with Rodimus or Wheeljack being about the same size and guys like Jazz or Sideswipe absolutely towering over him. Fans have made a big deal over his and Trailbreaker's small size, but scale has been all over the place since the genesis of the Classics/Universe/RTS/Generations series and it's something we should be used to by now. Besides, the issue is being overstated. Hoist is only a little short -- he's not a comically undersized runt like Stealth Megatron, Thunderwing or Laser Rod Optimus. The bigger problem in my opinion is the lack of accessories. This has been a problem throughout the series, Hoist suffers more for it than most. The original toy came with his scanner, towing rig, removable hands and two different sets of wrist-rockets. That gave the toy many potential different looks, though his official character model usually pictured him with scanner, wings, one hand and one wrist-missile (kinda odd for a medic, come to think of it). The new toy doesn't offer any of that potential, and to make matters worse Hoist loses Trailbreaker's backpack/shield (which incorporates the look of the missiles) and replaces it with a small winch arm that folds up into a pistol. I think the engineering involved in the gun is cute, but it doesn't make the toy look any less sparse. I also take issue with the orange paint on his knees, which isn't thick enough to hide the green plastic beneath it. The same can be said about the hazard stripes on his gun, which sadly makes the whole thing feel cheap. On a positive side, Hoist is a champ in the articulation department. With shoulder, bicep, elbow, hip, mid-thigh, knee, waist and neck joints, he's quite poseable. His large feet make it easy enough for him to keep standing, too, though sadly his lower legs are mostly hollow so his centre of mass is pretty high up. Those two factors sort of cancel each other out, leaving him with pretty mediocre balance. Still, he's a fun toy to play with, pose or just fiddle with while you're watching TV. Overall, I can't help but think that Hoist's robot mode is lacking. With different colours and as a different character I'd probably like it more, but it just doesn't do one of my favourite Diaclone designs justice. Alternate Mode: Unfortunately, the alt-mode is more of the same. Hoist is almost entirely green here, with halfhearted yellow/black 'danger' stripes on his doors. His front bumper is black and his headlights are silver. The rear bumper and tail lights are left unpainted, which struck me as cheap initially until I remembered that they form the bottom of his feet...painting them probably wouldn't work out too well over the long run. His hubcaps are painted, a pleasant surprise on a modern toy, and he has a big Autobot symbol in the middle of his hood. A small tow-truck arm protrudes from the bed of the truck, but notably the bed is a solid block and none of the other gear you'd find on a tow truck is present, like emergency lights or supports for the towing arm. What is present is his sensor array, which just sits elevated above the top of the truck without even the slightest attempt to hide it. On top of that, Hoist's angled windshield and armoured passenger doors are clearly out of place, marking him as a military vehicle (which the openly armed Trailbreaker clearly was) that's been shabbily dressed up as something else. The clearly visible head folded into his roof doesn't do him any favours either, because while this feature blended fairly well on the dark Trailbreaker it is plainly visible on the bright Hoist. 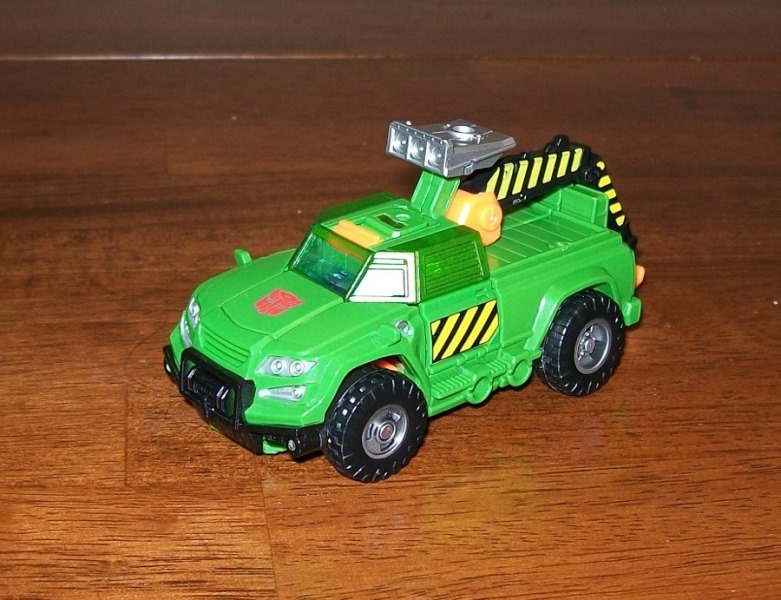 The only other thing to say about Hoist's tow truck mode is a rehash of something I mentioned for the robot: it's tiny. His arms and legs fold up tightly inside the alt-mode, meaning that the truck is even more of a runt compared to some of the older cars than the robot mode was. But that's okay. The truck mode is so silly I'll probably never want to look at it again, anyway.